Can I use a custom font? From which sources can I add fonts? The good news at the beginning: You can add custom fonts to your wall if you are using our Pro or Premium versions! What sources of custom fonts can I use? As long as the font is available as a webfont (e.g. Google Fonts) you're good to go. 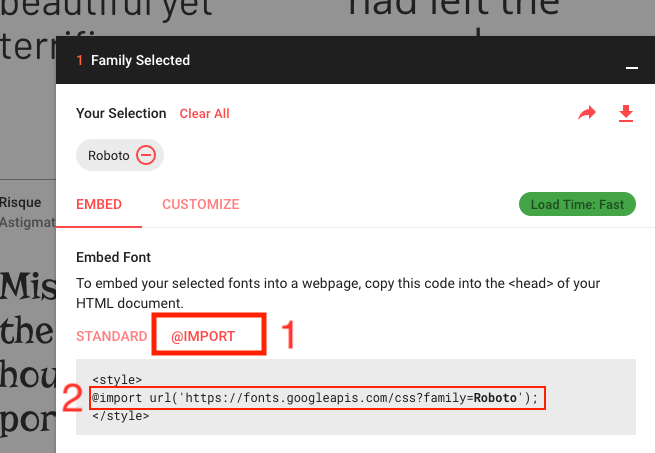 After selecting the Font you would like to use on your Wall, choose the @import embed method for the Font (1) and copy the @import line (2). Afterwards, paste the @import line into the custom CSS settings of your Wall (found on your Design settings page).